Telenor today announced that Easypaisa transactions crossed PKR 2 billion mark, with one million transactions instances in total. Six months ago easypaisa began offering convenience to the Pakistani customer. 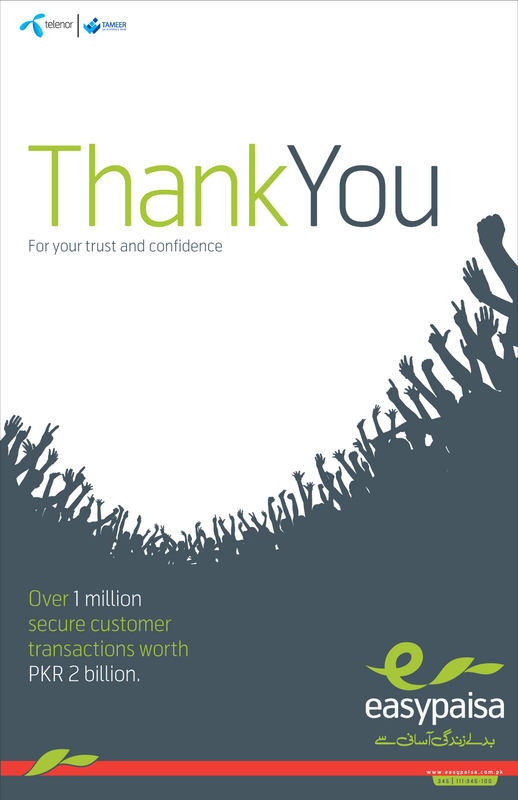 The relationship of trust and confidence that has since developed has enabled us to carry out over 1 million secure transactions worth Rs2 billion. From its launch, easypaisa has worked towards changing the life of customers by providing them convenience. The development of a vast network of over 6,500 retailers in a short span of time is testament to easypaisa’s commitment towards its customers. Today, whether paying a bill or sending money across to a loved one, easypaisa customers are enjoying a new era of convenience. not an impressive statement made by Telenor …. 2 Bn Rs. means almost 300,000 Rs. per shop (6500) in 6 months, which is around 50000 Rs. per month, which is around Rs. 1700 per day in transactions value. not at all bad ..
kch naya hy yaar,itna b chala, kisi ka faida hua, kafi hy ..